This set of Tricky MATLAB Questions and Answers focuses on “Simulation – 2”. 1. What does the following toolbox do? Explanation: The above toolbox is used for the analysis of the system and check the control system parameters which gives an insight into the nature of working and stability of the system that has been modelled. 2. What does the following block show? Explanation: The above block is configured to view the final value of a signal after simulation. It helps to identify the final value but only up to the time for which the model is getting simulated. 3. What does the following block do? Explanation: The Bias block is used to add a bias signal to any signal. This essentially means adding a DC value to the input i.e. if the input signal is a sinusoid, it’ll start from the given Bias or D.C. value at t=0. 4. What does the following block do? Explanation: The above mathfunction takes an input and ends up giving an output according to the given input and the user-chosen function. It does not multiply the input with function so it really isn’t doing anything mentioned in the rest of the options. 5. What is the name of the given block? Explanation: The s domain is referred to the Laplacian domain. The z-domain has a separate block. Hence, only laplacian domain is correct. 6. Simulink allows the simulation of systems using block diagrams. Explanation: The Simulink allows the user to set up blocks which represent functions and can be used to model a system. Hence, the above statement is true. 7. What is the function of the following block? Explanation: The above block gives a 1 if the input is positive and a -1 if the input is negative. 8. What are the transistors present in Simulink? Explanation: The datasheet of any transistor can be specified in the transistor model. Hence, only option User defined is correct. 9. How many sinusoids can this block generate simultaneously? Explanation: This block samples a sinusoidal signal and can generate multiple sinusoidal signals by giving vector inputs as parameters to the block. 10. What is the value of the constant supplied by the block? Explanation: This is a block present in MATLAB and can be used to model a constant signal. The value of the constant is user defined. 11. What is the no. of bits used for the counter operation by the following block? Explanation: This block uses the minimum no. of bits required for a counter operation. It doesn’t initialize bits according to the number of bits of the system so it saves a bit of memory. 12. What is the reference power while converting to dB for the following block? Explanation: The reference power for this block is pre-defined in MATLAB. To convert the voltage to dB, the reference power is 1W but to convert it to dBm, the reference power is 1mW. 13. This block can be used in what kind of systems? Explanation: This block is not restricted to logical systems. It can be used for any system, which is being modelled in MATLAB, and check the simulation results at instants where the user feels it needs to be checked. 14. What does this suggest? Explanation: Since the ramp function is plotted in the y-axis, it is seen that the value of the y axis is 0. 15. What is the function of this block? Explanation: This block allows us to model both continuous and discrete time systems for simulation. 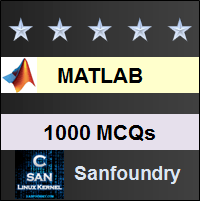 To practice Tricky questions and answers on all areas of MATLAB, here is complete set of 1000+ Multiple Choice Questions and Answers.